Thursday will start like any other day in the Suk household. Bella, a freshman at Blake, will get up before her older sister Maddie, a Hopkins senior who tends to sleep a little later. They will do what they need to do to get ready, then head off for the day’s activities. 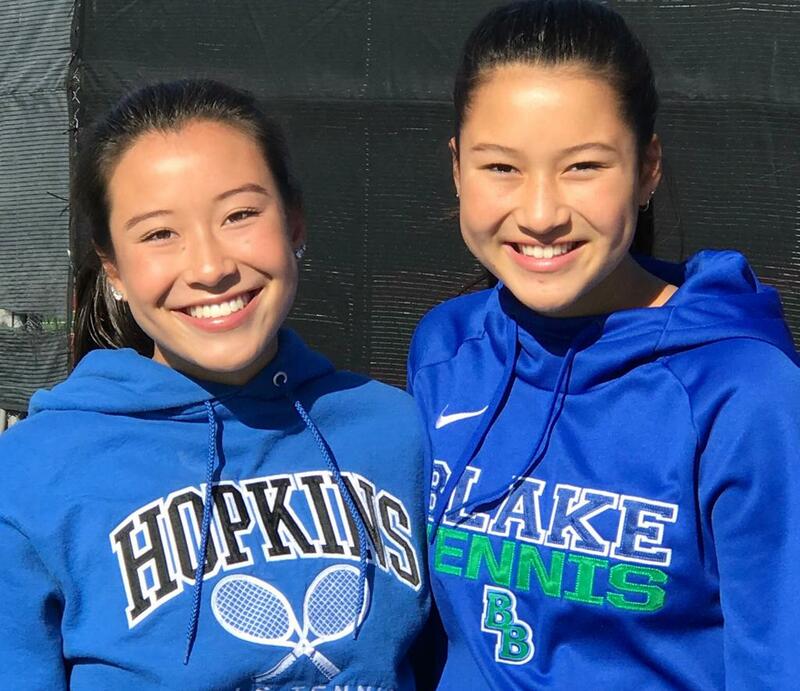 But rather than going to school, the Suk sisters will head to Minneapolis for their respective first-round doubles matches at the girls’ tennis state tournament. The two very close, very supportive sisters are seeking state titles for different teams in different classes. The Suk sisters have been attending different schools since Bella switched from public to private school in the third grade. “It was a better fit for me,” she said. Perhaps, but playing on different teams led to a lingering regret. “It’s a bummer that we’ve never been able to play together,” Maddie said. Maddie spent most of the regular season ranked among the top five singles players in 2A, but injuries to her left shoulder and right elbow forced her to alter her postseason plans and switch to doubles. She approached teammate Rachel Kelly about playing doubles together. Despite not being paired up before, Maddie Suk and Kelly had only one tough match — a three-set victory in the Section 6 semifinals — en route to the section title. With both sisters playing on different teams, it has led to a tug-of-war for their parents, who have grown accustomed to going their separate ways to watch each girl play. “That’s been the way they’ve done it: Divide and conquer,” Bella agreed. Playing for different schools has also led to good-natured ribbing among siblings. If there is a drawback to the situation, it’s that concurrent state tournament schedules won’t allow the sisters to support each other in person. “It would be fun to watch her play, but we will definitely be checking up on each other,” Bella said. Location: Class 2A, Baseline Tennis Center, Minneapolis; Class 1A, InnerCity Family Tennis Center, Minneapolis. Class 2A: Edina earned the No. 1 seed in the team tournament and is led by two of the top singles players in the state in junior Nicole Copeland, last year’s state champion, and senior Andrea Jansson. Minnetonka picked up the No. 2 seed and Rochester Mayo was seeded third. Copeland is the No. 1 seed in singles, but what is notable is who isn’t in the field. Eastview’s Karin Young, who was ranked No. 1 for the latter half of the season after beating Copeland head to-head, lost to Jansson in the Section 6 semifinals. Class 1A: Blake has gone wire-to-wire as the No. 1-ranked team in the class and is shooting for its fourth consecutive title. Pacing the Bears is junior Arlina Shen, who is seeded No. 1 in the singles bracket. Shen lost to now-graduated teammate Lainey Axell in the singles final in 2017.